Bikes and riders of all types are welcome at the MS Bike Tour. Photo by Bike MS Utah. April 21, 2016 – Bike MS, a two day bike tour organized by the Multiple Sclerosis Society of Utah will hold their 30th anniversary ride on June 25-26, 2016 in Logan, Utah. The ride consists of two days of cycling through the beautiful roads of Cache County. The ride raises funds for research on multiple sclerosis, a disease that damages the myelin (nerve sheath) and can cause muscular impairment, extreme fatigue, blurred vision, and numbness. We asked Melissa Mathews of the MS Society to tell us more about this year’s event. Cycling West: This year is the 30th Anniversary of Bike MS. What special festivities and themes will you have this year? Bike MS: Our theme this year is “Throw Back Thirty” to celebrate our 30 years of Bike. We want to celebrate our heritage, our cyclists who have been riding with us for 30 years and really capitalize on the 80’s decade. We are encouraging our Rest Stops to also celebrate the 80’s. Harmons, our presenting sponsor is hosting a Rest Stop at the 30-mile mark to celebrate our 30th Anniversary with an 80’s band. We will have other bands and entertainment as well throughout the event. Cycling West: Tell us about the courses for each day. What are the highlights? What is the difficulty level? What are the length options each day? 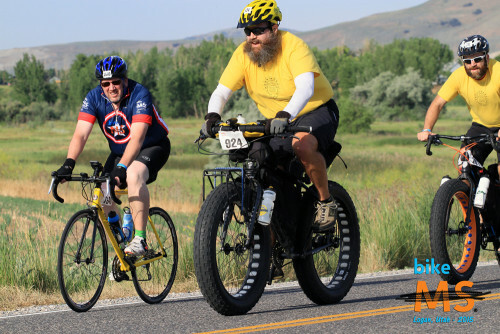 Bike MS: This two-day event is based out of the Cache County Fairgrounds in Logan, Utah and offers route options for all levels of cyclists. Riders can choose to ride as little as 45 miles one day or as much as 150 miles over both days. Day one’s course heads north towards Idaho and is relatively flat with options of 45, 75, or 100 miles. On Sunday, cyclists can take a 20-mile option or a 50-mile option of the beautiful ride up Blacksmith Fork Canyon and still enjoy lunch with us back at the fairgrounds. Cycling West: Tell us about the mission of the ride. How do you use the funds that are raised? Bike MS: Harmons Best Dam Bike Ride is Utah’s largest cycling fundraising event with 2,000 cyclists raising over 1.5 million annually. Our Bike MS helps to fund critical research and help provide programs and services to assist the 1 in 300 people in Utah impacted by the disease. There is no cure for MS and it is not known what causes it, but today there are 13 disease-modifying therapies that are helping to change the course of the disease and helping people with MS live more active lives. Prior to 1993, there were none. Cycling West: What are the rest stops, lunch, and support like? Bike MS: The seven Rest Stops on Saturday and three Rest Stops on Sunday provide a place for riders to stop and relax with a beverage and snack. Lunch is provided for all cyclists and there will be entertainment at the lunch rest stop. We will also have great support from our local Bike Shops to assist our cyclists throughout the ride. Cycling West: What is the best way to participate in the ride? Is there extra support if needed for riders with MS? Bike MS: Cyclists and volunteers come from throughout Utah, and other states to ride throughout beautiful Cache Valley, up in Logan. Cyclists ride for the personal challenge, the camaraderie of riding together and for the cause – a world free of MS. There is extra support for riders with MS. We encourage everyone to ride, no matter what level! This isn’t a competition and we look forward to seeing all levels of participants. Bike MS: We are looking forward to celebrating our 30th Anniversary with our participants and encourage everyone to register and start fundraising.